Placing a new floor covering can be a long and messy process, especially when you must remove the previous floor covering prior to installing the new surface. When the old floor material is a still strong ceramic tile surface though, you can place the new covering over the tiles as long as you create a smooth surface beforehand. With a floor leveling compound, the smooth subsurface is easy to create. All that's required is spreading the compound over the prepared tiles. From there, the compound does the rest, curing into a smooth level surface that you can cover with confidence. Cover tile floors with floor leveling compound to create a hard level surface before placing a new floor covering. Remove the baseboard and trim surrounding the tile floor to make space for the new surface level. Pull the boards away from the wall with a prybar placed between the wall and the rear of the board or trim. Set boards and trim aside for reuse after installing the leveling compound and new flooring. Search the floor for any loose or damaged tiles. Remove loose tiles and leave the space open for filling with the compound. Remove any broken pieces. Examine the grout lines. Remove any loosened grout with a chisel and hammer. Replace the grout in the lines using a grout float to push the grout into place. Wait overnight for the grout to set. 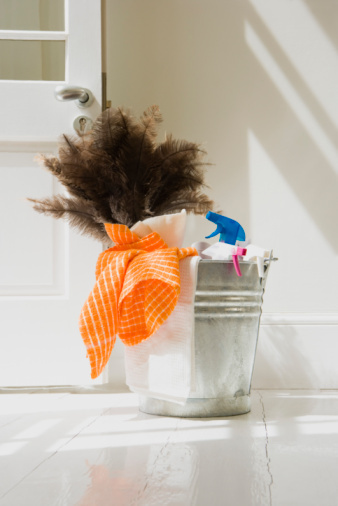 Clear any dirt or debris from the floor with a push broom. Clean the tiles with a tile cleanser and a nylon scrub brush to remove oils or ground-in dirt. Rinse with clean water, and then dry the tiles off with a piece of cloth. Mix the self-leveling compound in a large bucket using a drill with a mixing attachment. Add enough water to the compound to create the consistency of a thick pancake batter. Pour the compound onto the floor over the tiles. Begin at the end of the room furthest from a door and work your way towards the doorway. Spread the compound with a steel trowel, building a layer about 1/4-inch thick over the tiles. Allow the compound to cure in place for 48 hours before stepping onto the floor or proceeding with the installation of new flooring.